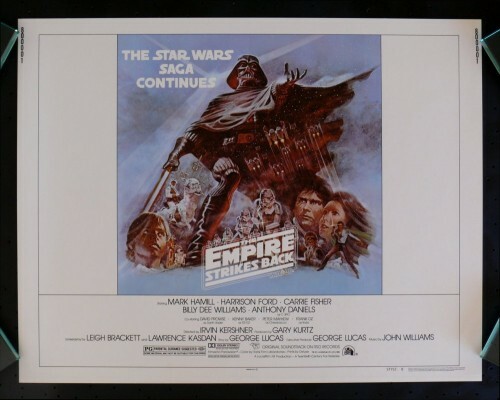 Here is my final Empire Post (for now) and it can only be the final two episodes of the National Public Radio dramatization of the classic sequel to Star Wars. I hope you enjoyed this past week of Empire goodies. 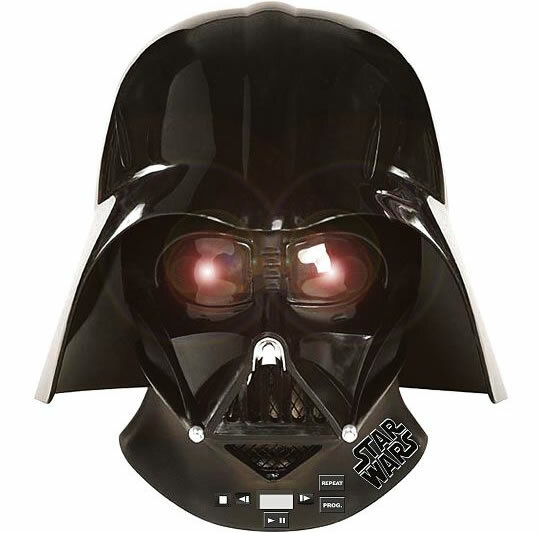 I hope to post more Star Wars related items in the future as well as the usual fun stuff! Also, I looking to making a new logo for the blog. If anyone has any ideas or even artwork please send it my way. As my time has become limited, I would love to have someone design a logo for me. 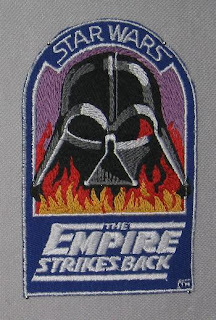 Anyway, here are the final two episodes of NPR's The Empire Strikes Back. Enjoy! The lunchbox was a standard must have every year when I was a kid and if you had a super cool one with the latest hit movie or tv show, it was a bonus. I always felt bad for the kids who had to buy the hot lunch or take their lunch to school in brown bags and just assumed the brown baggers were too poor to get their own lunch box. 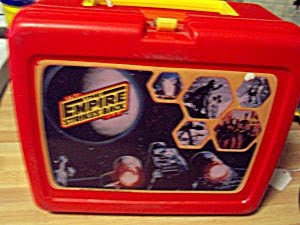 These were the days of the metal lunchbox. Not those flimsy plastic ones that broke with one drop. However, as the 80s began, the metal ones were on their way out with the plastic ones coming on full throttle. 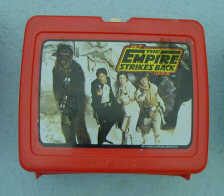 This was evidenced by the several different lunchboxes released for The Empire Strikes Back. This one was mine. 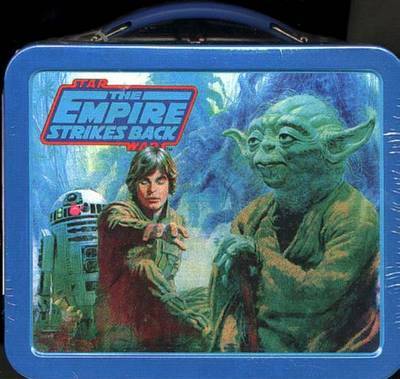 It was, by far, the coolest of all of the lunchboxes that year. Featuring a great photo of Luke discovering Yoda on one side and an amazing shot of the Snowtroopers on Hoth on the other. The original Star Wars lunchbox was cool but this blew the doors off of that one. It was almost like someone said, "We have to make this lunchbox the coolest lunchbox in the world. We have to make the lunchbox just as cool and awesome as the movie." They, of course, succeeded. The side panels (just as important as the main pictures) were pretty cool as well. How can you go wrong with good versus evil?! 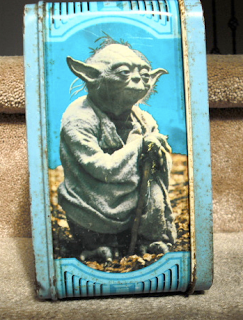 One one side was the good: a great picture of Yoda. The opposite side was the menacing Darth Vader flanked by two stormtroopers. Pure genius! And let's not forget the top and bottom strips. These sides and top and bottom pictures are what set the great metal boxes apart from their not-as-cool plastic off spring. Those would be just one picture (a sticker mind you!) plastered on the front and that was it. 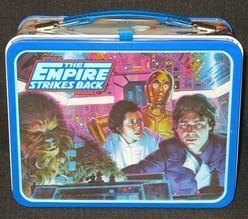 There would be no cool painting of Bespin on the bottom of the plastic lunch box. Nor would there be a picture of everyone's favorite droids on the top. Only if you had the mighty metal lunch box, would you get to enjoy these great pictures on a daily basis! 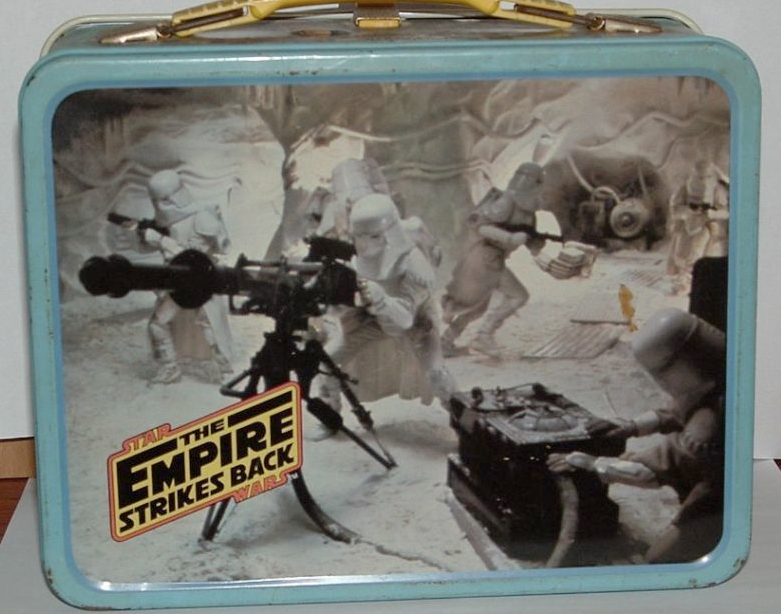 This lunchbox also featured one of the first plastic latches to hold the front on and prevented all of your edible goodies from falling on the ground as you walked to school in the morning. 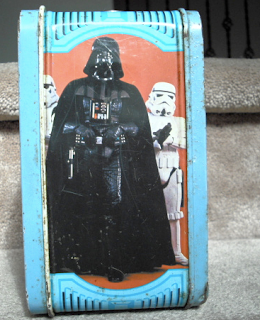 Some of you are probably saying, "but Dartman, I had the cool metal lunchbox but mine was completely different from the one you had". That's because there were two. The other metal lunch box featured super cool paintings from scenes in the film. Though not as cool as the photos, these were still pretty cool images to sport on a lunchbox. The photo of Luke with Yoda is represented in artistic form from a different angle and gives the great Jedi master an air of greatness by use of perspective. And it also appears that Luke has already started his traning here as his hand is extended and his eyes are closed, thus willing you to eat your lunch through the use of the Force. 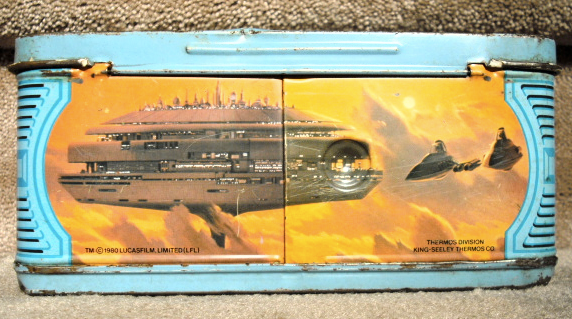 The flip side features a magnificent painting of the goings on in the cockpit of the mighty Millenium Falcon. This is cool as Han Solo is not represented at all on the photo model. It seems odd to me now that he wasn't. If I remember correctly, my friends and I all thought Han was the coolest of the cool but yet none of us minded that he wasn't on our metal status symbol. It might have been the fact that we were in awe of the majestic coolness of Yoda at the time. 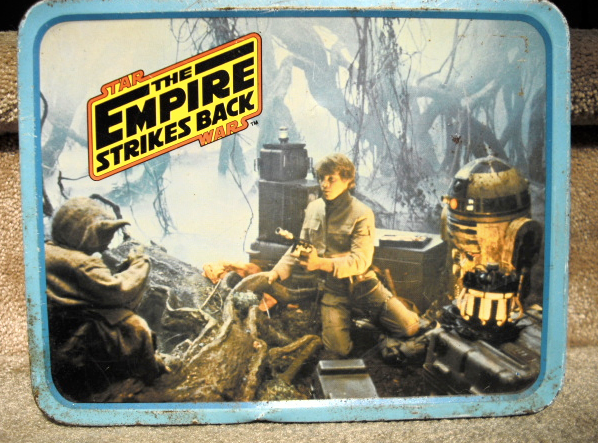 The sides of this box featured a collage of various characters from the film and some scenes that were non-existent on the other box. The sides showed Luke on a Tauntaun and Vader surrounded by stormtroopers, bounty hunters and Lando. (I wonder why they threw Lando in with the bad guys?) While the top had a nice painting of the Hoth battle complete with At-Ats and the bottom had a nice space shot of the fleet of Star Destroyers. 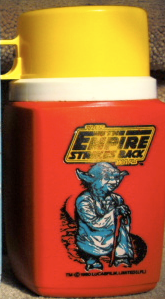 (couldn't find any great pictures of those) The thermos was pretty much exactly the same as the other one except it was blue and the image of Yoda was reversed. I'm not sure if that one came with the flip top. 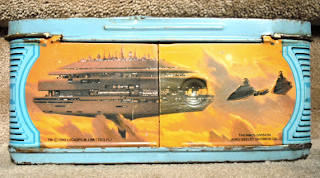 Along with these two great metal lunchboxes, there was also two plastic lunchboxes released as well. Both of them were red and were nowhere near as cool as the metal ones. The first and better of the two plastic boxes featured a strange, posed promo shot of our heros somewhere in the inner corridors of the rebel base on Hoth with their weapons drawn and pointed right at you. Kind of like, "eat your lunch or we'll blast you into kingdom come". This whole scene seems very strange to me. It doesn't happen in the film at all. Even the painted box features scenes from the actual film. Not to pick on anyone who had this one but I think it's kind of a cheap substitute for the cooler metal ones. At least put one of the photos from the metal on on the box! Come on. If you think that one's bad, there was another that was even worse. 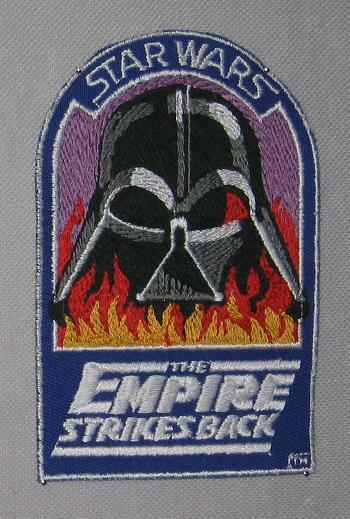 This time around, it was sticker of an X-Wing fighter approaching a planet with small shots of scenes from the film. While this does sport scenes from the actual film, it just looks cheap and horrible. Not to mention the main image just doesn't make any sense at all. Are we to conclude that the X-Wing pictured is Luke's as he is approaching Dagobah? I don't remember that scene looking like that! If you had this one, I'm sorry. There's nothing else I can say. 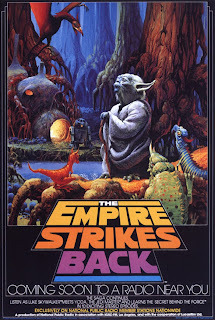 Here are episodes 7 and 8 from the great radio dramatization of The Empire Strikes Back. National Public Radio did a great job with these. The added lines of dialogue are quite interesting. The voices don't always seem to fit the characters but maybe that's because I'm jaded by hearing the story albums over the years. Anyway, here are the next two episodes. Enjoy! A few posts ago I shared the Marvel Super Special comics adaptation of The Empire Strikes Back with you. 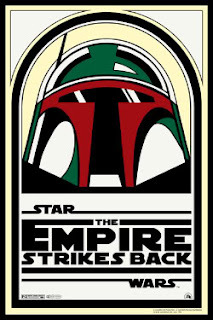 In 1997, Darkhorse Comics released what they called "The Empire Strikes Back Special Edition" comic. 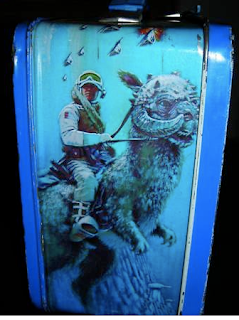 It sported a new cover featuring a portrait of Han Solo against the backdrop of Bespin. Other than that, it was pretty much the exact same comic book. They brightened it up a bit and added what I can only call "color correction" to make it look a lot nicer, but it is still the same comic book. 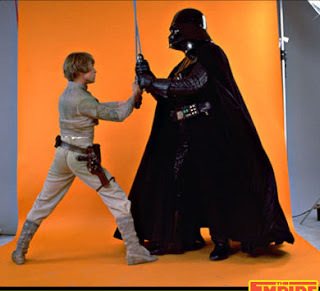 See if you can spot any other differences when you check out "The Darkhorse Empire Strikes Back Special Edition". Enjoy! Here are the next two episodes in the great NPR radio dramatization of "The Empire Strikes Back". Complete with the original music and sound effects from the film. It's kind of like listening to one of those read along records. Enjoy! One of the most popular downloads here at the World of Wonder is MECO's Star Wars and Other Galactic Funk. Since then, I have posted MECO's version of the Wizard of OZ and that holds a place in the top twenty most popular sharities as well. Well, as we all know, after "Star Wars" came "The Empire Strikes Back" and MECO was there to put his take on the sequel. Although not as popular as the first Star Wars record he made, it is still pretty good. A little bit shorter but just as disco-y, here is MECO's The Empire Strikes Back. Enjoy! Here are the next two episodes of the National Public Radio dramatization of The Empire Strikes Back! Enjoy! I remember being a kid and going shopping at a mall with my parents. My dad and I hit the record and book stores while my mom and sister went looking for girlie items. 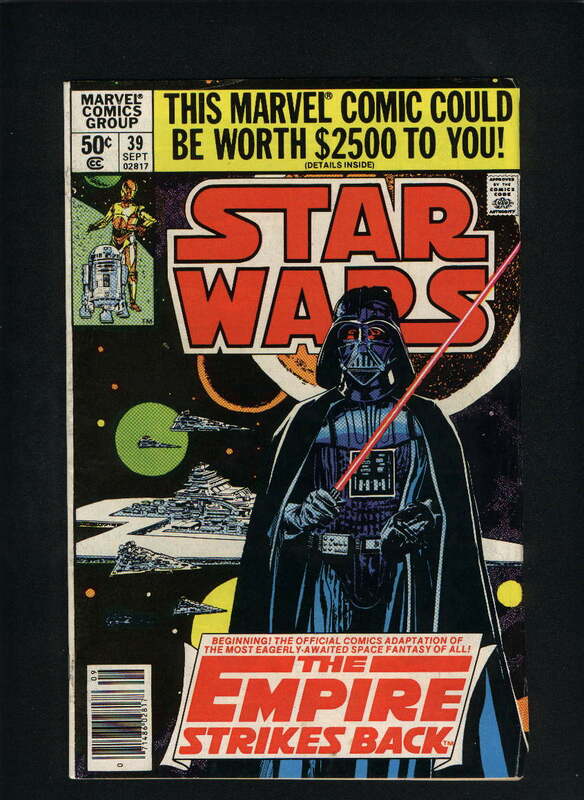 At the book store, I used my allowance money that I had saved up to purchase the paperback version of the Marvel Super Special of The Empire Strikes Back. A book I still own to this day. When I excitedly showed my mom and sister, my sister's response was "Why would you waste your money on that?". At this, my dad came to my defense with "He found a bargain. It was on sale and he saved a dollar. That's smart shopping." In all fairness, that was coincidence. I just bought it because I wanted it and I had money in my pocket. But I still appreciated my dad coming to my defense. Now that my sister has a 6 year old who is obsessed with Star Wars, I always smile smugly and get a great feeling when I happen to see the occasional Star Wars item that she spent HER money on. Anyway, I share that incredible Marvel comic super special with you now! Enjoy! After the giant success of the Star Wars films, National Public Radio got on board the Force Train with their own radio adaptations of the films. 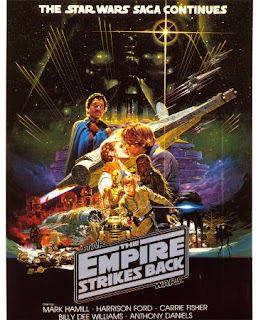 They did one for each of the films and The Empire Strikes Back got the royal treatment with a full ten episodes containing not just the original film plot but also scenes that the movie never showed you. Such as; The Imperials discover the planetary probe evidence that leads them to the Rebel base; Luke Skywalker and Han Solo await rescue in an emergency shelter on the frozen surface of Hoth; Han Solo and his first mate, Chewbacca, fix the Falcon—and demolish each other's egos; Luke encounters a medical droid that could match See-Threepio for politesse anytime; The Rebel control room on Hoth during the rescue of Han and Luke and the desperate battle against the Imperial walkers; Luke's last-minute rendezvous with his X-wing squadron during the Battle of Hoth—on foot and inside Yoda's cave on Luke's first morning of training in the mysterious ways of the Jedi. Behind-the-scenes details come to light as well in an informative introduction by the script's author, Brian Daley—who wrote the episodes, reworked scenes on the spot in the recording studio, creating the National Public Radio dramatization broadcast on stations nationwide. The story of The Empire Strikes Back comes to life again in these original scripts—this time with more background, more scenes—more Star Wars! Over the next couple of days I will be sharing these episodes with you. Here now are the first two. Enjoy! Since today is the 30th anniversary of the greatest Star Wars movie ever, I thought I would repost this gem from my collection. Enjoy! 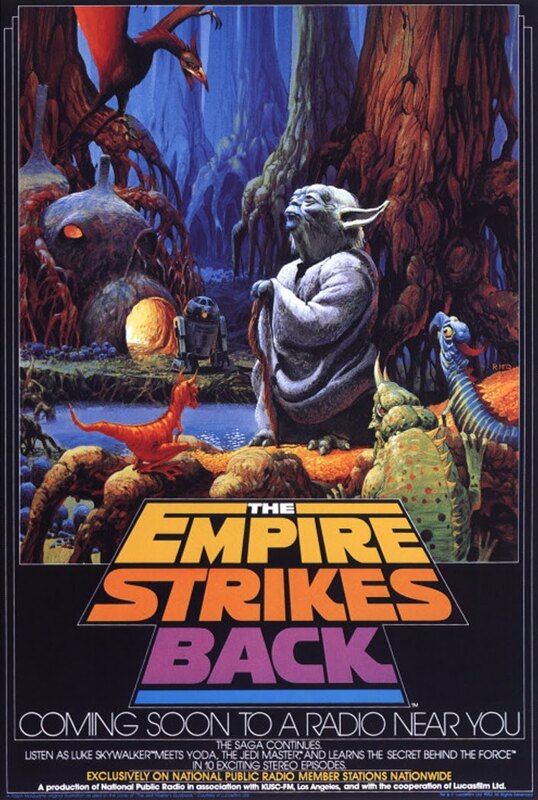 Here is the Original Soundtrack Story Album for The Empire Strikes Back. This goes in my book as the best album cover in the history of the world! 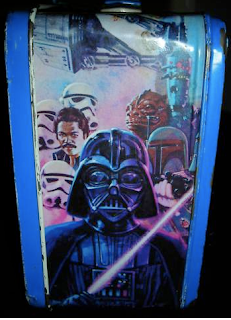 It is an original painting that features the duel between Luke and Darth Vader surrounded by a border of various scenes from the movie. Even though this is the album that features the soundtrack, voices and sound effects from the film, it is not called The Story of The Empire Strikes Back. 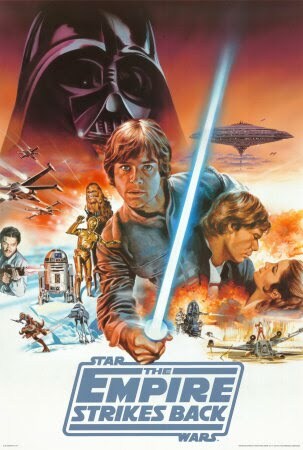 Instead, RSO Records decided to call it "The Adventures of Luke Skywalker". Why they did this I don't know. But I do know that it is super cool! Here it is for you to enjoy! Here is a great episode from the first season of The Bionic Woman. We need more shows like this again! (Not to mention that we need these shows on DVD!) Enjoy! The Best of The World of Wonder: And The Angel Sings . . . When it comes to celebrities making records, there has never been a decade as great as the seventies! It gave us Telly Savalas, John Travolta, Anson Williams, etc. . . . the list goes on and on. And now I present to you one of the best of those albums - "Cheryl Ladd"! This album is great! Cheryl started out singing back up on the Josie and The Pussycat recordings and then got into acting from there. This is her first album and I remember holding it and staring at it while playing it as a kid. (I think the cover jumped started my journey into puberty!) From my dad's collection to mine and now to yours, here's Cheryl Ladd. Enjoy! Following the Bill Frawley post from last week, here is an issue of the 1950s comic caracterization of the classic show, "I Love Lucy". This is the 6th issue of the series from 1955 and features some funny story lines involving our favorite red head and her friends. Enjoy! There aren't many people in the world who don't know who Fred of Fred and Ethel are. If you were to ask those same people if they knew who Bill Frawley was, you might not get as a big of a response. 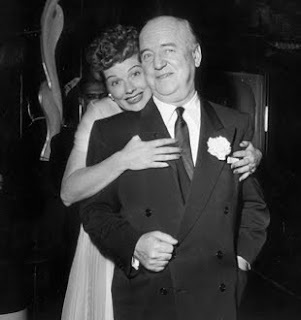 Bill Frawley was the inimitable actor who portrayed the lovable landlord for the Riccardos. Most of his life was spent in show business and he appeared in over a hundred films, but he will always be remembered for his role as Fred Mertz. As a child, he formed a vaudeville act with his younger brother, Paul. Six months later, he wrote a script named Fun in a Vaudeville Agency which earned him over five hundred dollars. He then moved to Denver, Colorado, where he was hired as a singer at a café. He met and teamed up with pianist, Franz Rath. The two men relocated to San Francisco with their act, "A Man, a Piano, and a Nut." During his vaudeville career, Frawley introduced and helped popularize the songs "My Mammy" , "My Melancholy Baby", and "Carolina in the Morning". By 1951, the 64-year-old Frawley had appeared in over 100 movies but was starting to find film role offers becoming fewer. When he heard that Desi Arnaz and Lucille Ball were casting a new television situation comedy and were looking for someone to play the part of the , miserly landlord Fred Mertz. Gale Gordon was the first choice to play the character. Fortunately for Frawley, he was unavailable due to a prior commitment and the rest is history! 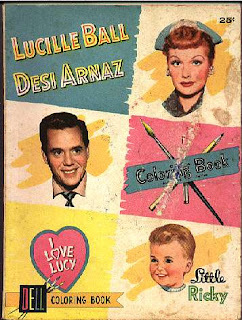 In 1958, using his success from "I Love Lucy", he recorded many of his old stage songs on an album. I share that album of classics with you now. Here is "Bill Frawley Sings the Old Ones." Enjoy! PS - Sorry about the lack of posts lately. I have been extremely busy and will be for the next month or so. I will do my best to keep posting new things but it may not be as frequent as usual. I love Starsy and Hutch and own the entire seires on DVD. Watching the shows brings back fond memories of Saturday nights when I was young. A regular Saturday night was going to Church followed by dinner at McDonalds, Burger King or Roy Rogers and then off to my aunt and uncle's where my dad, uncle, cousin and grandfather would sit in the living room watching television while my mom, sister, aunt and grandmother hung out in the kitchen. I couldn't tell you what the conversations in the kitchen were, but I knew the ABC Saturday night line-up very well. Starsky and Hutch at 8, The Love Boat at 9 (that always seemed like a two hour show for some reason) and Fantasy Island at 10. 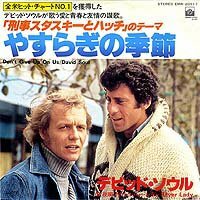 My dad loved Starsky and Hutch just as much as I did and even owned two of David Soul's albums, which I am proud to have inherited. Watching the shows now brings mixed feelings. It makes me sad to watch them without him, but it also reminds me of the great times we had watching them together. Today's post is for my dad. It's David Soul (Hutch) singing his heart out on his first album, "David Soul". The Best of The World of Wonder: McNichol Mania!!! 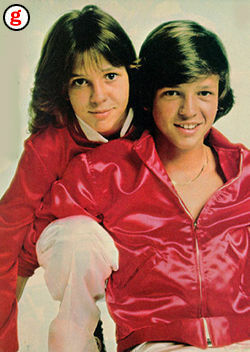 In keeping with the tv stars that sing theme, I bring you 1978's "Kristy and Jimmy McNichol". Not as bad as the Scott Baio album, this album boasts more of a funky diso edge to it. Believe it or not, it actually spawned a hit with their cover of "He's So Fine" which is one of the highlights of the album. Also included are a bunch of pics from the album's promotional campaign and a copy of the groovy clothing line order form that came with the record! Rock on with your bad selves! In regards to all of the requests to re-up any past sharities that have dead links or are no longer working - all I can say is I'm sorry. I simply do not have time to go back and re-up any of them. Once they are gone, they're gone. Odds are they are out there on-line somewhere as the "sharity blog" community is a pretty incestuous bunch and we all re-use each other's items. If you enjoy the blog and my sharities, you can thank me by checking out our sponsors below! It only takes a second and that's all you have to do. You don't have to buy anything or sign up for anything. Just click on an ad every time you visit! You can also say thanks by sending a donation to The Richard S Dart Memorial Arts Scholarship by clicking on the donation button down below. All donations are tax deductible! Thanks and enjoy the blog!